H. P. Lovecraft was one of the most well-read authors of his time, and his personal library constitutes an intimate glimpse into his mind and imagination. This fourth revised edition provides comprehensive information on 1085 books owned by Lovecraft. These books focus chiefly on four key areas that Lovecraft found particularly fascinating: ancient literature and history; the history and antiquities of New England; astronomy, chemistry, and other sciences; and, of course, the literature of weird fiction. S. T. Joshi has supplied full publication information, tables of contents for many titles, data on Lovecraft’s discussions of the volumes in his stories, essays, poems, and letters, and a wealth of other information. To know Lovecraft’s mind, one must first know his books. In this updated edition, eighty new titles have been added to the list of books owned by Lovecraft, and additional information has been supplied on all titles listed. 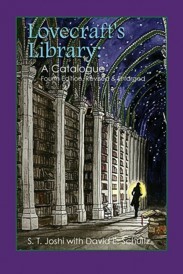 Lovecraft’s Library: A Catalogue. By S.T. Joshi. New York, NY: Hippocampus Press; fourth edition, revised & enlarged; 2017; ISBN 978-1-61498-217-3; 204 pages; softcover. This book may be purchased in softcover (second edition) from Amazon.com or Barnes & Noble, in softcover (third edition) from Amazon.com or Barnes & Noble, or directly from the publisher, Hippocampus Press.